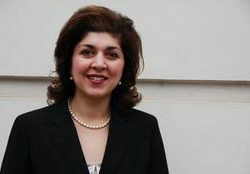 Fletcher Board Member Farah Pandith, F95, wins Distinguised Achievement Award from Tufts University Alumni Association. Pandith has been promoted by the U.S. Department of State to the first-ever position of Special Representative to Muslim Communities. Prior to this appointment, she served as Senior Advisor to the Assistant Secretary of State for European and Eurasian Affairs, in senior positions for the National Security Council and the U.S. Agency for International Development, and as vice president of international business for ML Strategies, LLC, in Boston. 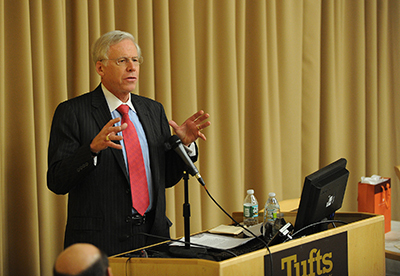 The Fletcher School of Law and Diplomacy recently welcomedBoard Member Charles Dallara, F75, F86, managing director of the Institute of International Finance, to present the 2012 Constantine G. Karamanlis Chair in Hellenic and European Studies Annual Lecture. In his discussion, titled the “Greek Economy at a Crossroads,” Dallara addressed the ongoing challenges posed by the Greek financial crisis and made several recommendations on how to move the economy forward. Read more about Mr. Dallara's talk.